A native of New Zealand, James has performed at the Kauffman Center, Carnegie Hall, Alice Tully Hall, Riverside Church, and the renowned Joe’s Pub in New York City. He has appeared with such organizations as The Ravinia Festival, Joy in Singing, Southern Opera, The Southern Sinfonia, The Little Orchestra Society of New York, The Orpheus Choir, The Merola Opera Program, The Schwabacher Recital Series, The Opera Company of Middlebury and The Japan Society of New York. He completed his graduate studies at the Manhattan School of Music in May of 2008. While there, he was the Orvis Foundation Scholar and was awarded the Janet D. Schenck Award for his distinguished contribution to the life of the school. 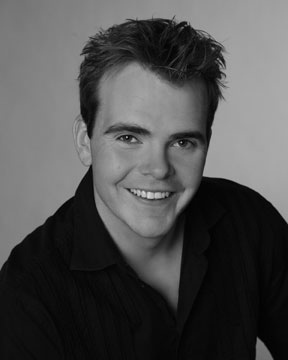 James’ roles include: Pluto in Offenbach’s Orpheus and the Underworld; Sam in Kurt Weill’s Street Scene, Britten’s Albert Herring, Monteverdi’s L’Orfeo; Tamino in Mozart’s Die Zauberflote; Nadir in Bizet’s Les Pecheurs des Perles; The Baker in Stephen Sondheim’s Into the Woods; Billy in Weill’s Mahagonny Songspeil. Concert, Song Cycles and Oratorio works include: Britten’s Winter Words; Schumman’s Dichterliebe; Weill’sFour Songs of Walt Whitman; Douglas Lilburn’s Sings Harry; Berlioz’s L’Enfance du Christ; Handel’s Messiahand Judas Maccabeus; Haydn’s Creation, Nelson Mass and Theresa Mass; Beethoven’s 9th Symphony; Bach’s Christmas Oratorio and St John’s Passion; Vaughn Williams’ Hodie; Mozart’s Requiem; Saint-Seans’Christmas Oratorio. James’ awards and honors include: A 2010 Arts Excellence Award from the Malvina Major Foundation, Winner of the Joy in Singing Competition (2008), Winner of the Lotte Lenya Competition (2007), Wellington Rotary Scholarship, Marie D’Albini Scholarship, Bell Gully Travel Award, Sir Henry Cooper Memorial Scholarship in Music, grants from the Lankhuyzen/Whetu Kairangi Masonic Trust and the Malvina Major Foundation. This season James will perform with Opera on the Avalon, the Banff Center’s Opera as Theatre program as well as performing Schumann’s Dichterliebe on April 8th with pianist Jillian Zack. James will also take the role of Marco Polo in the World Premiere of Christopher Cerrone’s Invisible Cities, to be staged in New York at the Italian Academy in May. In July he will sing the title roles in Jekyll and Hyde with the Mac-Haydn Theater. James is currently working on his debut recording with renowned pianist Kenneth Merrill. The disc, “Exiled” The extrication of Kurt Weill, will be released in 2012. James resides in New York City.